Grilled Pork Chops with Grilled Peaches recipe. A family favorite. And conversation that I had with a food stylist that helped me out with a recent media segment. We got to chatting about what goes well with grilled pork chops…I said peaches, she said mango, I said pineapple…and here we are. A tropical fruit trio. 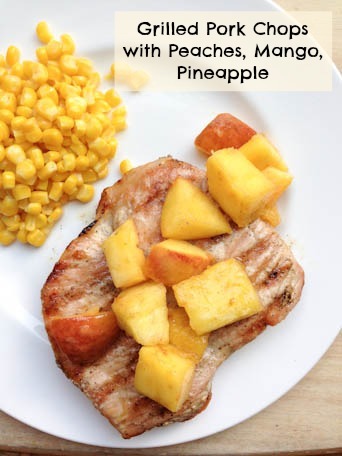 Pork chops do really well with applesauce, and with grilled peaches…and now we can add pineapple and mango to the mix as well. We really enjoyed the “grilled fruit salsa” and these pork chops! Simple is good…and this is a really good simple recipe for your next grill-out! Grill the seasoned pork chops until no longer pink in the middle, or reaches an internal temp of 160. Let rest for 3 minutes. In a grill basket, toss together the mango, pineapple and peach chunks with a couple dashes of cinnamon. Grill along side the pork chops, for about 8-10 minutes, tossing often, or until slightly softened. Serve the Grilled Pork Chops with Peach, Mango & Pineapple over the top, along with veggie and/or bread side dish.